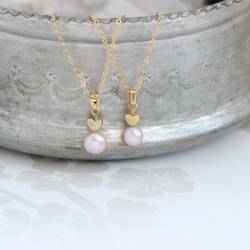 The mini version of the very popular pearl pendants. 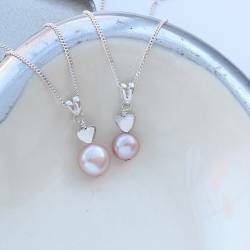 A delicate freshwater pearl in white, pink or peacock is combined with a sterling silver rose gold or gold heart to create the perfect gift for a little girl. They also perfectly match the adults version. So you can order necklaces for both Mother and Daughter. For bridesmaids and flowergirls. Your necklace will be beautifully gift wrapped in an amethyst coloured box, tied with ivory satin ribbon and a gift card enclosed. This standard service is completely free of charge. 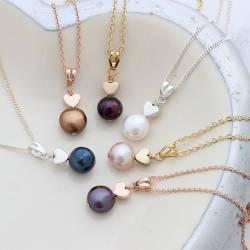 Sterling silver or rose gold or gold plate and freshwater pearls.